Take control of your blood pressure with our free Blood Pressure Log for Android. Analyse your pressure and share the data with you doctor. 19 out of 20 users leave positive ratings. 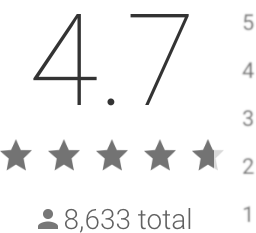 That's compared with only 4.4 and 4.2 stars for the other 2 most popular apps. Lots of charts and analytics. See the user manual below for full list of available tools with description. Print your data or send it by email to your doctor. Export an Excel spreadsheet or raw data in other format to run custom analysis.